It is only rarely that a scholar is universally recognized as the single best source on the art of a place or time. Even more rarely, one expert can become the arbiter of the history of an entire historical period for a place like Rome. Richard Krautheimer, born in Germany in 1897, doubled that and encompassed two long Roman periods, the Medieval and the Renaissance. Unfortunately, only his thoughts on the former period can now be easily accessed: Krautheimer died at the age of 97 in 1994, and his writings were predominantly on the medieval period. To get at what he thought about the Renaissance, you have to go to the works of his distinguished students, James Sloss Ackerman, John Coolidge, Howard Saalman, and others, all of whom acknowledge their debt to Krautheimer. Krautheimer taught the Renaissance, mostly in American universities after he fled Hitler's Germany in the 1930s (like several other German Jewish art historians, he eventually became a lecturer at the Institute of Fine Arts at New York University) but he seldom wrote about the Renaissance, because, he said, he preferred to write about things that were not already extensively elucidated by other authors. Richard Krautheimer did write extensively on Medieval art and architecture, but very little of it is available on the Internet. The net is, however, splashed with references to his books and studies: no one can write on the subject of medieval art and architecture without acknowledging that Krautheimer was there first. Krautheimer's books and studies are available for scholarly research in the libraries of universities with appropriate departments and in the national "academies" here in Rome. You may find them to be too expensive for individual non-professionals to buy: for example, his five volume set entitled "Corpus Basilicarum Christianarum Romae" on Rome's basilica churches, which was published one volume at a time by the Vatican's Pontificio Istituto di Archeologia Christiana between 1937 and 1977 (in several languages) now runs about $400 for the set. Much more accessible to the average reader, both in terms of price and content, is his "Rome -- Profile of a City, 312 - 1308", and the renewed availability of that book (in case you hadn't noticed it) is what prompted me to write this article. Libraries and interested students of the period snapped up copies of the "Profile" when it was published in two printings in 1980 and 1983, and copies quickly became rare. They were zealously protected by owners and coveted by those who couldn't find a copy. Long-standing friendships crumbled when "Profile envy" lead to thievery -- I know who "borrowed" my copy, and some day I'll get even! But now anyone can buy it again in paperback for just $25 from Amazon (http://www.amazon.com/exec/obidos/ASIN/0691049610). The format is the same, but the pictures are clearer than I remember, thanks to Princeton U. Press and the South China Printing Company of Hong Kong and to improved computer/printing technology over the past 22 years. The book is divided into two parts, either of which could be a complete volume on its own. Part 1, entitled "Image and Reality" tells the history of the city from the victory of Constantine over Maxentius in 312 AD, through the Christianization of Rome and the Romanization of Christianity (Krautheimer's elegant phrase, not mine), through the Carolingian renewal, then stagnation until the 12th century rebirth, and through the failure of the final Medieval flowering of the city in the 13th century. It stops just short of the Renaissance but clearly illustrates that the Renaissance was organically connected to the 13th century false starts. Part 2, "Forma Urbis Romae Medievalis" is more thematic. First, you probably already know that "Forma Urbis Romae" -- meaning "the shape of the city of Rome" in Latin -- is the way the ancient Romans designated topographical maps of their city. The most famous "Forma Urbis" in Imperial Rome was the gigantic 18 by 13 meter map carved in marble between 203 and 211 AD and mounted in the Imperial Forums on an inside wall of the Temple of Peace. (The temple was built by Vespasian from 71 -75 AD to commemorate permanent peace in the Middle East(!) and rebuilt, probably by Severus, after a fire in 191 near the end of the reign of Commodus). Fragments of the map were found where they fell from the wall and at other locations in Rome where they had been re-used. A huge computer project by Stanford University is now trying to fit the 1,118 extant pieces -- only 10-15% of the whole -- back together. Rudolfo Lanciani, the godfather of modern Roman archeology, did a print-version "Forma Urbis", also of ancient Rome, which incorporated the then known fragments of the Temple of Peace Forma and information derived from archeological excavations. Lanciani's map was made in the 1890's, and it is still used daily by modern archeologists along with his other publications. A new printing of the Lanciani "Forma Urbis" was made in two sizes for the 2000 millennium -- I could afford the smaller size. Also for 2000, the Vatican commissioned a new 1.54m by 1.7m "Forma Urbis", incised in bronze and depicting modern Rome, for display in the Vatican Library. All three of these maps are extensively documented on the Internet. The "Forma Urbis" section of Krautheimer's book is his narrative "mapping" of how Rome looked in medieval times. He starts by showing how sparse the remaining evidence is: even though the medieval city is still there, buried along with much of the ancient Roman level, beneath Renaissance and post-Renaissance Rome, most of it has never been excavated. Then he does a masterful job of laying out all the evidence that was available until 1983 to show how the inhabited and uninhabited quarters faired from the late 3rd century (actually before the period the book purports to cover) until the beginning of the Renaissance. It's important to remember -- and Krautheimer reminds us early on -- that this entire period from Constantine to the Renaissance was one of great population decline in Rome: in the middle of the third century, Rome had more than one million people; during the late third century economic depression its population dropped to 800,000; eventually, after periods of neglect, barbarian invasions, plagues, etc., it reached a low point well below 50,000 in the 12th and 13th centuries. None of the population numbers for those thousand years are certain, of course, because no census was taken in the whole period and secondary evidence is very sparse. Good numbers for Rome's population didn't return until well into the Renaissance. Despite the paucity of population and other information, Krautheimer presented his analysis of the situation during this period of Rome and Romans so persuasively that no one has thought otherwise since he first published his analyses, which he digested in this book in 1980. And what new evidence has surfaced since then has only confirmed his hypotheses. The only thing scholars rally argue about when assessing his work on the Medieval is whether this book provides enough information on a particular topic or whether you need to refer yourself to his more detailed works: for detailed information that scholars want on particular churches and other subjects, the more specialized volumes are clearly more useful. For us general readers, this book is probably enough, but it may also be enough to make you seek out those other more expensive volumes. Web searches for Richard Krautheimer, as mentioned above, produce few sites that actually show much of his writings and teachings. Most web citations, in fact, tell you how to find his books, or are bibliographical listings that include his printed works, or, in effect, boast of some institution's or individual's past association with the Olympian. 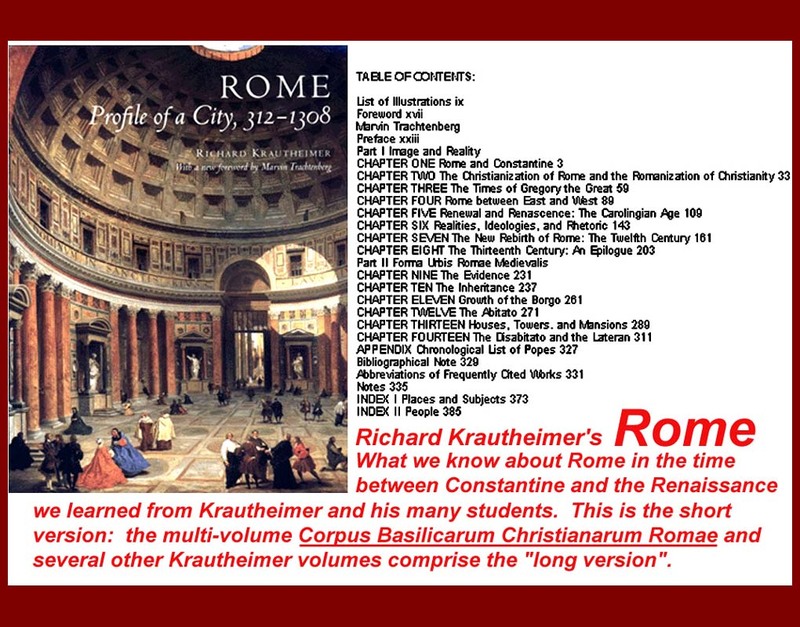 It would be a very rare web site, indeed, that could accommodate even such a broad-brush work as "Rome -- Profile of a City" which, with its miles of text and with 260 fine illustrations that include photos, maps, and drawings, many of which were made by Krautheimer himself. My advice: buy the book, and know what Art majors at universities all over the world know about Rome in Medieval times.